On April 1, the Metropolitan King County Council will consider passing a new Comprehensive Solid Waste Management Plan, the first full update to our garbage storage tactics since 2001. 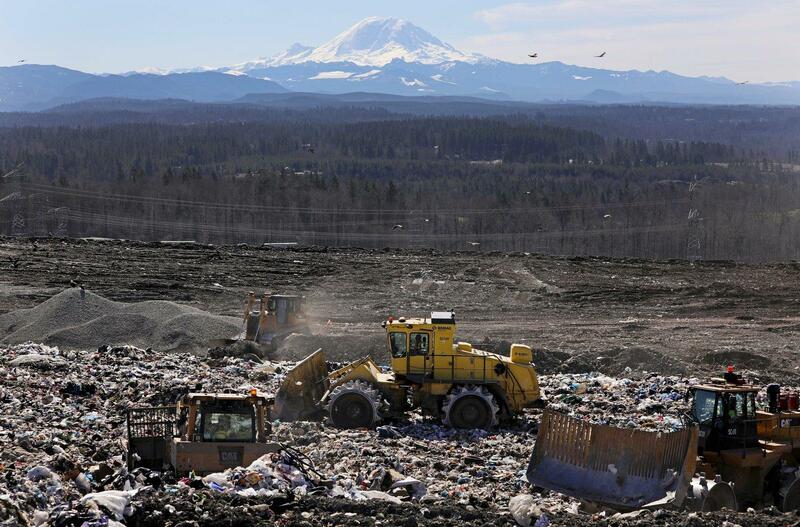 The plan proposed by King County Executive Dow Constantine would push the closing date back to 2040 by making up to $270 million of modifications – building a new dumping ground at the landfill site and allowing garbage to be stacked 30 feet higher than is currently permitted. On the one hand, this forestalls a costlier decision – what to do with the trash when the landfill does fill up. Each weekday, around 130 tractor trailers arrive at Cedar Hills, carrying with them a total of about 2,500 tons of garbage. They circumnavigate five decades of refuse – a hulking brown mound of patchy grass pierced with piping – to arrive at the summit where their trailers are tipped toward vertical, their contents spilling out, to be bulldozed into rough order. The pipes sticking out of the hill collect the methane that decomposing garbage emits. It’s piped to a bioenergy plant, on-site, which converts the gas into usable natural gas that’s pumped into Puget Sound Energy’s grid – enough to power about 19,000 homes a year. Cedar Hills takes the garbage of everybody in King County except for residents of Milton, whose garbage goes to Pierce County, and Seattle. Seattle ships its trash, by train, to a landfill in Arlington, Oregon. Since at least 2001, the county’s plan, once Cedar Hills fills up, has been to mimic Seattle – ship the trash elsewhere. The plants tend to be more popular in places with denser populations – where there’s less room for landfills – like Europe and Japan.